At Advanced Basement Systems, we understand that a basement can represent a very large portion of your living space. If you live in a one-story home, your basement could be half of your total square footage! If you're interested in protecting your home with a quality waterproofing system, call us at 1-844-320-1542 or click the button below to request your no-obligation consultation with a waterproofing specialist. We will provide you with a free estimate to install a waterproofing system in your home in Chatham, London, Sarnia, Windsor and nearby! Locally Owned And Operated Contractors: Advanced Basement Systems is locally owned and operated and has been in business since 2003. They're a stable, well-established company that's there when you need them! Our crews of waterproofers are experienced, well-trained professionals that work in basements and crawl spaces every day. The basement waterproofing experts at Advanced Basement Systems have seen it all, and they know just what needs to be done to keep your space dry all the time! 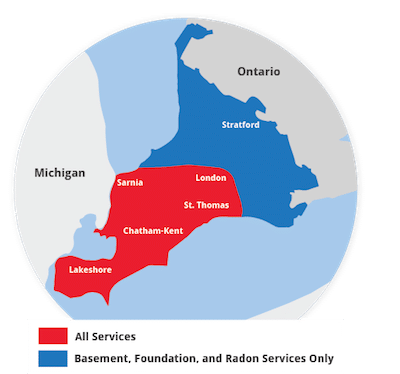 If you live in Sarnia, London, Windsor, Chatham or nearby, we're the contractors for you! We offer free basement waterproofing quotes to homeowners within our service area.